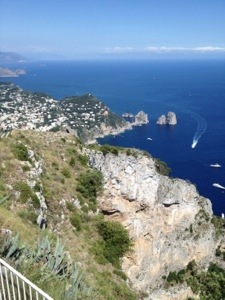 As I remember from my last trip to Sorrento, the area is just gorgeous. Two separate day trips to the Amalfi Coast and Capri were just perfect – gave us time to relax and absorb plenty of vitamin D. It was so hot that I decided to buy a hat – I am carrying it in the above photo. I seem to collect these fedoras everywhere I visit! We are now on our last leg of our Italy visit, onwards to Florence. Ciao!